Today I found out it is possible to mummify yourself. One such method of self-mummification was practiced by Japanese Shugendō monks as the ultimate act of self denial. Shugendō is a form of Buddhism that originally combined elements of Buddhism, animism, Old Shinto, mountain worship, and Taoism, among other religions. “Shugendō” itself means something to the effect of “the way to spiritual power through discipline”. The culmination of some of the Shugendō monk’s lives was to voluntarily choose to mummify themselves, a process called Sokushunbutsu. This ritual lasted around nine years, six of which the monk would be alive for. The payoff for monks that achieved self-mummification was that they were seen as a Buddha and were then supposed to be placed in a temple for others to see and honor. Failed attempts, which seems to have been the case a large percentage of the time, resulted in the bodies simply decomposing. As you might imagine, mummifying one’s self is a process that is excruciatingly painful, hence why individuals who were successful were considered to have achieved a state of perfect enlightenment. The monks would begin by ceasing eating any food except various nuts and seeds, with some accounts stating that they were also allowed to eat fruits and berries. They would also begin a regimented program of heavy physical exercise, which they would continue throughout this first period that lasted one thousand days. During the next one thousand days, the monks would further restrict their diet by only eating bark and various roots, again with some accounts stating that they were also allowed to eat a limited amount of fruits and berries. Near the end of this period, they would drink regular draughts of a drink made from the sap of the Urushi tree. This tree’s sap is mildly poisonous and is normally used as a natural lacquer. Ingesting the drink caused the person consuming it to vomit frequently, further restricting the body’s ability to obtain nutrients from the sparse diet they ate. They would also rapidly lose bodily fluids due to vomiting. This sap also has the mummifying side-effect of acting as a preservative. In the final stage of self-mummification, the monk’s body would be little more than skin and bones. If the monk survived to this point, he would lock himself into a stone tomb that was just large enough for him to fit in, sitting in the lotus position, which is a position he would not move from until he died. The tomb itself contained an air tube, so that the monk could live for a time after being entombed. It also contained a bell, which the monk would ring on a daily basis to let those outside the tomb know he was still alive. While in the tomb, the monk would sit in the lotus position and meditate until death. Once the monk died and, thus, no longer rang the bell each day, the breathing tube would be removed and the tomb sealed for the final thousand day period of the ritual. At the end of this period, the tomb would be opened to see if the monk was successful in mummifying himself. If he was, the preserved body would be put on display in the temple. Having successfully demonstrated mastery over the physical, the priest would also then be declared a Buddha. This practice continued until around the 19th century when it was outlawed by the Japanese government. While the bodies of these monks were supposed to be removed from their tombs after the final thousand day period, archeologists have unearthed some of these self-mummified monks very recently, implying that, for whatever reason, this removal did not always happen, perhaps because the body was not seen to have been preserved well enough, so was simply left where it was. 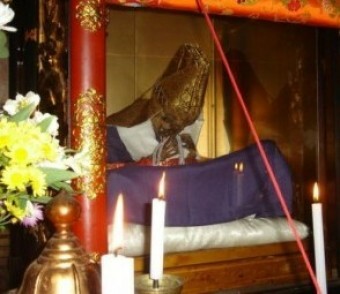 The latest such self-mummified monk discovered was in July of 2010 in Tokyo. 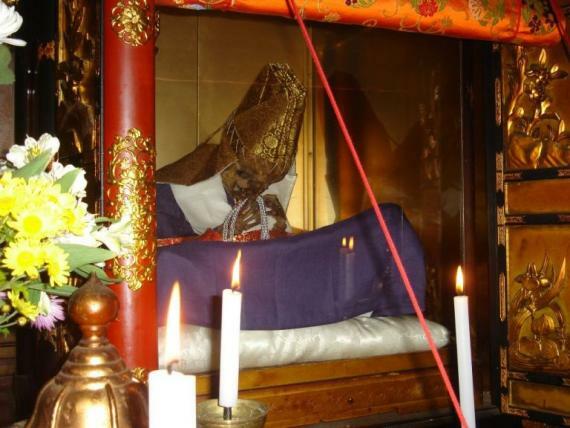 Around two dozen of these self-mummified monks can be seen in Japan today. The sap from the Urushi trees contains Urushiol, which is also in poison oak, poison ivy, etc. When this substance in the tree sap comes in contact with water and oxygen, it forms a very hard lacquer. The Shugendō sect of Buddhism was once banned in Japan during the Meiji Restoration. Today, Shugendō is practiced primarily by Tendai and Shingon sects of Buddhism. Buddhism was founded by Siddhārtha Gautama, a spiritual leader who taught around India throughout his lifetime. He is thought to have been born in Lumbini, Nepal, around 500-400 BCE. This whole self mummification thing gives me the creeps. Those monks must have had a lot of self discipline to be able withstand the whole process. I’m a huge fan of this website and have read probably 100 articles in the past month due to my boring job. However, I’ve noticed you have written “hence why” in a couple of them (including this one) which is really annoying even for someone who isn’t particularly great with grammar like me. I just wanted to point that out. Now I have to contemplate how disgusted I feel for becoming one of those people I hate. This is probably the most bizarre article I’ve ever read. The things people will do in the hope of escaping the human condition is astounding. This Practice only confirms my opinion that religion causes stupidity.